Have you worked on other festivals in the past? Why did you choose Redondo Beach as the location? Los Angeles, CA — The BeachLife Festival is excited to announce its 2019 music lineup for a first-of-its-kind coastal event in Los Angeles happening May 3 – 5, 2019 at Redondo Beach, CA’s Seaside Lagoon. 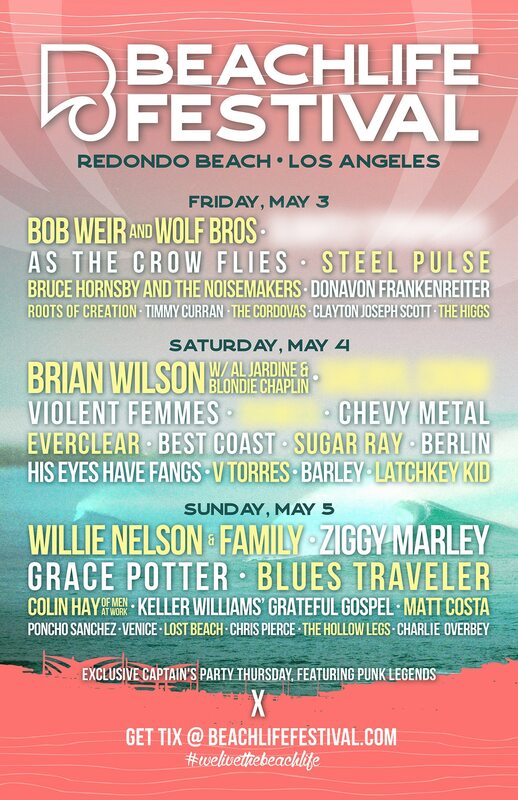 The three-day immersive experience celebrating Southern California beach culture will feature iconic headliners Brian Wilson, Bob Weir and Willie Nelson performing oceanside, along with artists who are synonymous with SoCal ‘beach life’ including Ziggy Marley, Violent Femmes, Steel Pulse, Grace Potter, Blues Traveler, Bruce Hornsby, Everclear, Chevy Metal, Sugar Ray, Donavon Frankenreiter, and many more.